Molly and her mother, Esther, live right down the street from one another. They have a good relationship, and they’ve become closer since Molly’s father passed away a few years ago. Without Molly’s father around anymore, Esther is demanding more of Molly’s time. Molly loves her mother, but she is getting frustrated with having to care for her when she–Molly–should be home taking care of her own children. Now Molly is frustrated with her husband and, like many caregivers in the sandwich generation, feels torn between two worlds. She doesn’t know what to do. All of us have a penchant for people-pleasing, and so many of us have been taught that we are valued–and valuable–when we care for others. We care for our loved ones, our children, and friends in need. When we take care of people at the expense of caring for ourselves–and our immediate families–then we need to stop, listen to the Spirit, and learn to set boundaries so that we don’t burn out. 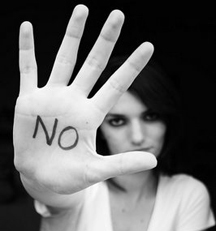 The spiritual discipline of saying “no” is one of the hardest to practice, but it is one of the most critical in maintaining a healthy relationship with God and with others. It is a practice important for families, for loved ones; and, it is even important in the workplace. I know of a bridesmaid and bride who stopped talking to one another years after the wedding because the bride demanded too much from the bridesmaid. The bridesmaid chose to say “yes” to everything she was being asked to do instead of being honest enough to tell the bride that she felt used and manipulated. The bridesmaid enjoyed being in the wedding party, and she longed to make sure the bride had the best wedding ever. The lack of boundaries burned her out, however, and she stopped participating in the relationship once the wedding day had passed. All the bridesmaid had to do in order to save the relationship was practice the art of saying “no” to some of the things she was being asked to do. One of the best ways to practice this spiritual discipline is to try it on the small things in life. When a loved one whom you trust asks you to do something that’s easy–say, go to the store or participate in a dinner party–politely, but firmly decline. Give a general reason, but be positive: “That sounds like a good opportunity, but I have a previous engagement at that time.” You have the right to keep your “engagement” confidential, even if the engagement only amounts to you staying home to watch a favorite movie. Another way to practice this spiritual discipline is to keep a calendar in which you block off time for work, recreation, rest, and other obligations. I find that if I don’t write things in my calendar related to my family, I either forget about them or I don’t make time for them. It’s better to write down appointments no matter how innocuous than to forget or break a promise to a loved one who is counting on you to be somewhere at a specific time. This includes making time to catch up on rest. I block off Saturday nights for some good “me time.” I don’t make plans, and I don’t make promises about that time. It’s my night to rest before having to preach the next day. If a friend asks to spend time together, I look for another time to do so. I know this is harder when you are actively caring for someone or need to help someone who relies on you, but saying “no” will improve and salvage the relationship in the long run. What good is it if you always say “yes,” but your spirit grows in resentment towards a loved one who needs you to be honest, healthy, and whole?